Electrical:Adelaide, Brisbane, Canberra, Darwin, Melbourne, Perth, Sydney, Wollongong, Queanbeyan. Call 13TRADIE - We'll Get the Job Done! 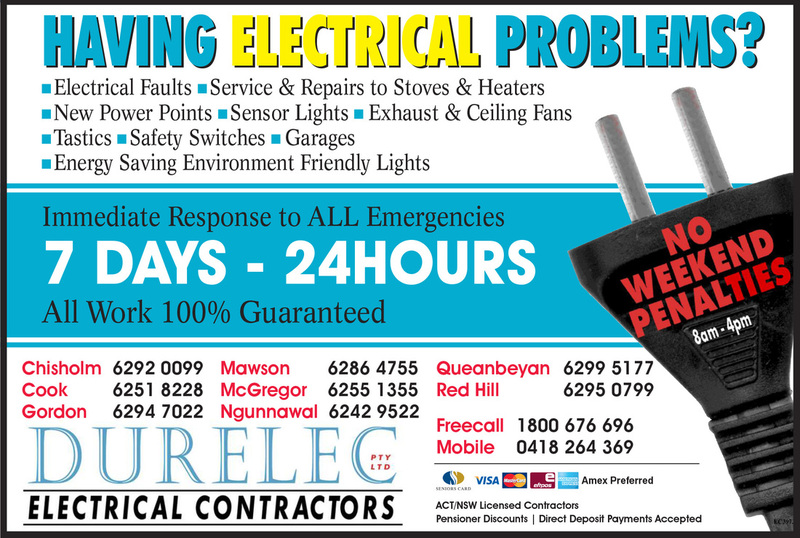 Yellow Pages Advertisment Canberra Directory 2015 Electrical. Having Electrical Problems? Electrical Faults, Service and Repairs to Stoves and Heaters, New Power Points, Sensor Lights, Exhaust and Ceiling Fans, Tastics, Safety Sitches, Garages, Energy Saving Environmentally Friendly Lights. Immediate Response to all Emergencies 7 days - 24 hours All work 100% Guaranteed. Durelec Electrical Contractors/ electricians. Seniors Card, Visa, Master Card, Eftpos, American Express, Pensioner Discounts, Direct Deposit Payments Accepted. Adelaide, Brisbane, Canberra, Darwin, Melbourne, Perth, Sydney, Wollongong, Queanbeyan. No Weekend Penalties 8am - 4pm. Call 13TRADIE - We'll get the job done!